Stop that annoying noise or I'll shoot! Alarmed by violence? This won't help - the new Gun O'Clock from Japanese toymaker Bandai, due for release this November 15. 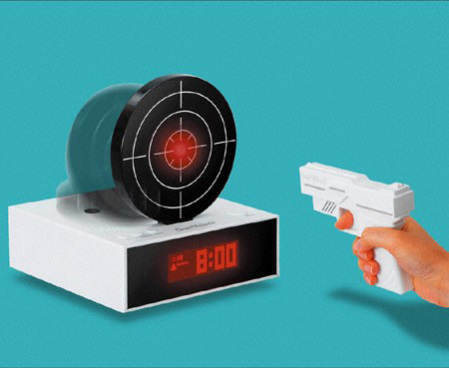 It's just the latest of a number of weird and bizarre alarm clocks that require the bleary-eyed sleeper to take extraordinary means to quell that persistent wake-up call. In this case, it's shooting the clock. Editor's Note: Th Gun O'Clock may have been discontinued but an almost identical gun target alarm is now availalble in the U.S.You can see it here at Amazon. Mars Rover Hits Anniversary... and Lands Staff Dates!